Washington, D.C., circa 1925. 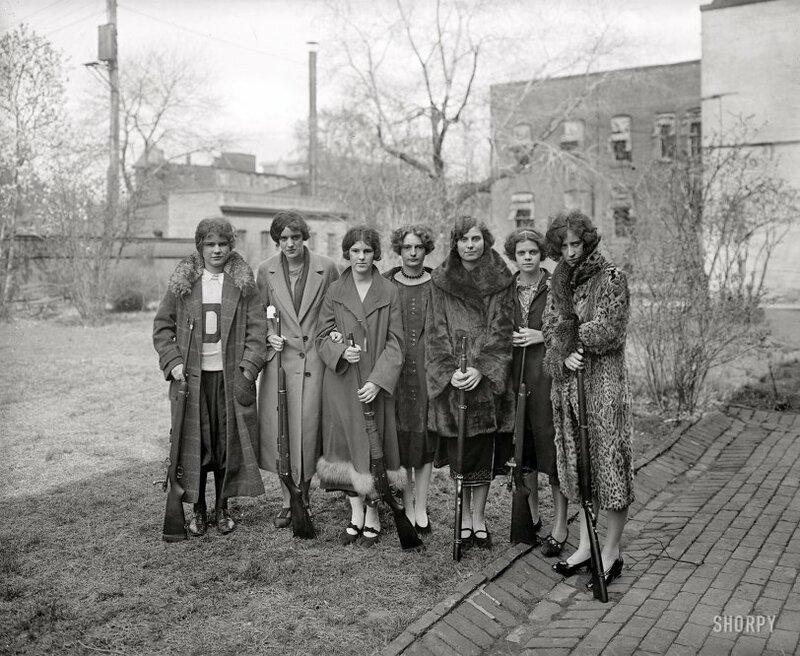 "Girls' rifle team of Drexel Institute." National Photo Company Collection glass negative. View full size. Submitted by Anonymous Tipster on Thu, 03/11/2010 - 3:45pm. Submitted by Anonymous Tipster on Sun, 04/12/2009 - 11:58am. Only one of the "what rifles are they?" comments is accurate. To start with, all rifle competition has always been done using .22 caliber weapons. A very few national matches are held using higher caliber but .22 is the norm, believe me. The short stock rifles are obviously the special .22 version of the '03 Springfield, and the rolling/drop block "Martinis" are Winder muskets, based on the 1885 action. A friend of mine once owned a custom 1885 action that was chambered, believe it or not, for the old .218 Bee cartridge. The identification of the very early Winchester 52 is also interesting as the 52 is arguably defined as the best, at least American, target rifle ever made. The classic 52 story has a young guy asking an oldtimer what's so special about the 52. The old guy thinks for a few seconds then replies, "Son, there's .22s and there's 52s!" Submitted by Anonymous Tipster on Thu, 02/05/2009 - 12:57am. I'm surprised there's so much negativity about these young ladies. When I saw the one on the far right, my first thought was, "Leopard coat? There's a woman who's not afraid of putting some drama in her style." I'll bet she listened to jazz and could make her own bathtub gin. Submitted by Anonymous Tipster on Wed, 02/04/2009 - 8:33am. Actually, the tape would have been used to improve grip. Not to hold the rifle together. Note that the barrel band is intact. A rule of thumb. Or head. Submitted by Anonymous Tipster on Sat, 01/31/2009 - 9:42pm. As a high school teacher in Colorado in the early 1950s, I was the faculty leader of the rifle club. A standard rule of safety was don't point your gun at your head! Drexel must have had a new team of shooters each year. Submitted by aenthal on Sat, 01/31/2009 - 4:10pm. The one on the far right must be their instructor or adviser. Not only is she a decade older than the other people in this picture, she looks mean enough to have shot and skinned the animals for her coat all by herself. I suspect the tags on the coats might be an access pass to the shooting range (same idea as a ski lift ticket). You wouldn't want just anybody wandering into a place where there was live ammunition. You would need a way to tell at a glance, and from a distance, who belonged and who did not. They probably all have them, just those two are pinned where you can see them in the photo. The others may not have pinned theirs on yet for the day, or already taken them off for next time. Submitted by Dnace on Fri, 01/30/2009 - 10:53am. The Ladies ream was still going strong when I was at Drexel in the late 1950's/early 60's. The tape on the rifle in the middle is to improve the grip of the forestock, not to hold the rifle together. They were still using the M2's when I was there. Submitted by silent lurker on Thu, 01/29/2009 - 8:24pm. Submitted by Anonymous Tipster on Thu, 01/29/2009 - 8:07pm. Hey, you know what they say. An armed society is a polite society. Betcha nobody whistled or cat-called at any girl around the Drexel campus. Submitted by Zerotime on Thu, 01/29/2009 - 7:15pm. Submitted by Anonymous Tipster on Thu, 01/29/2009 - 5:18pm. 1 and 5. Obviously Springfields from the bolt throw (and barrel band sights), although my M22 MII does have a finger-grove stock. 2 and 3. Winchester Model 52 (early type with the folding ladder rear sight). Don't hassle me - I just took mine out of the gun safe to compare! The Springfields don't have the button clip release - it is a latch at the forward edge of the clip. Also, the chamber is WAY too short to be a .22 mod of an '06 action. 4 and 6. Both Winchester 1885 falling blocks - No. 6 a "Low Wall" Winder (all in .22 short). (Fortunately the lady's hose provide a good enough background to see the dropped rear of the action.) I have a 1885 "High Wall" in .22LR that is a musket stock, but I'd bet money this is a true Winder. Submitted by Anonymous Tipster on Sun, 01/25/2009 - 10:53pm. Is this where Klinger went through basic training? Submitted by Anonymous Tipster on Fri, 01/23/2009 - 4:30pm. My mother, married in 1922, hated the hair and clothes styles so much that she destroyed the one photo that was taken to commemorate the day. I can assure you she remained stylish to her dying day but not according to whatever everyone else was wearing. I regret that so many of us tend to follow the current trend instead of thinking for ourselves. Submitted by Irish Al on Fri, 01/23/2009 - 3:47pm. Hairstyles of the era really did nothing for them, did they. Submitted by MikeG on Thu, 01/22/2009 - 11:52pm. The rifles are all .22s, the Springfields are either M1922 or M2 .22 caliber training rifles. The single shots that one commenter thought was a rolling block are in fact Winchester .22 caliber "Winder" muskets built on the Winchester model 1885 action (the one on the far right is a "low wall" action. The fact that these are all .22s does little to take away from the level of marksmanship these women may have had and in fact all of the rifles are of extremely high quality. Submitted by Anonymous Tipster on Thu, 01/22/2009 - 8:50pm. The condition and variety of their rifles notwithstanding, it appears that the squad had a very good record. Drexel fielded noteworthy rifle teams all throught the '30's and '40's at least. I could not find this particular photo, but there were many articles, often with photos, about the girls' team at about this time. A selection follows. "The girl students of the Drexel Institute in Philadelphia have organized a rife team and, under the instruction of Lieut. J. P. Lyons, U.S.A., military instructor at the Institution, are rapidly becoming expert marksmen." Rock Valley Bee, 21 January 1921. "Drexel Institute, of Philadelphia, had two wonderful rifle shooting teams the past indoor season - one of boys, the other of girls. So good was the girls' team that Capt. J. P. Lyons, the instructor, said: ‘I would like to match the girls against any boys' rifle team in the country.' When the instructor talks that way the girls must be counted on as real shots. They were. They didn't lose a match. Next season, it is more than likely that the girls will be eligible to try for the university team. Drexel won 16 of its 18 matches, lost 1 and tied 1 - with Yale. In five of its matches Drexel made perfect scores." Washington Post, 18 June 1922. "Girls' rifle team of Drexel Institute defeated a picked sharpshooter squad of Philadelphia police in a match." Hammond, Indiana, Times, 25 February 1926. Submitted by Dave Hall on Thu, 01/22/2009 - 12:12pm. The two towards the right seem to be either Remington rolling blocks or some variant on the Sharps rifle. Including the '03 Springfields, we are talking a minimum of .30 caliber. None of these gals seem to be toting the traditional .22 caliber rifles used in competition. We're talking deer -- or, ulp! man-killing -- weaponry! Submitted by Bob Dole on Thu, 01/22/2009 - 5:44am. Only type I recognize is the two M1903 Springfield rifles - second and third from the left. Submitted by Anonymous Tipster on Wed, 01/21/2009 - 10:58pm. The girls #2 and #3 from the left each have a tag hanging from their coats - anyone know what that would be for? Submitted by Ole Cooter on Wed, 01/21/2009 - 7:24pm. Apart from the spelling, my other quibble with Vernon's comment is that a well-aimed rifle shot is not the only thing about these women that may render a man impotent or feeble-minded. Submitted by Jingles on Wed, 01/21/2009 - 6:22pm. Seems to be four different rifles. Submitted by phil from down under on Wed, 01/21/2009 - 5:53pm. There are no men in this photograph! Submitted by Anonymous Tipster on Wed, 01/21/2009 - 1:34pm. I'd venture a guess the fur is real, kinda makes me think girlfriend on the far right is the spoiled one. Submitted by Otis P. Driftwood on Wed, 01/21/2009 - 11:10am. There were soon to be no stray cats or dogs left in that neighborhood. Fewer kids, too, for that matter. Submitted by Anonymous Tipster on Wed, 01/21/2009 - 10:59am. ...so what else could they be coming for??? Submitted by Martyd17 on Wed, 01/21/2009 - 10:18am. Now this is what we need for protection -- Attitude and Beauty! Submitted by Anonymous Tipster on Wed, 01/21/2009 - 10:13am. I think, like the haircut, it's a plea for help! Submitted by dude on Wed, 01/21/2009 - 9:51am. This photo can open up many snarky comments but I have to ask if any of them ended up in Alaska, maybe hunting from an aeroplane? Submitted by Anonymous Tipster on Wed, 01/21/2009 - 9:36am. You noticed the bolt on her rifle? What about the bolts in her neck??? Submitted by Kairho on Wed, 01/21/2009 - 9:15am. The Original Broad Street Bullies. Submitted by Anonymous Tipster on Wed, 01/21/2009 - 8:43am. Interesting, none of these rifles have slings. Submitted by Anonymous Tipster on Wed, 01/21/2009 - 8:29am. My gunnery sergeant would not have been happy with the material condition of No. 3's weapon. She won't take "no" for an answer. Submitted by Vernon on Wed, 01/21/2009 - 7:47am. Before computer dating, it was not uncommon for the less attractive ladies to go out and bag a husband. She needed to be a good shot as not to render him impotant or feable minded. Submitted by Railsplitter on Wed, 01/21/2009 - 7:37am. ...but not as safe as it could be. I have a bolt action rifle with very similar bolts, and if the safety lever is in the "safe" position you not only can't fire the gun but can't work the bolt either to load a round. Still, the preferred method is to have the bolt open (as most of them are) when the weapons are displayed in this manner. One might argue that they are not all pointed in a safe direction either (which you do always, even if the bolt is open and there are no rounds in the magazine). A couple of the ladies appear to have their rifles pointed right at their heads. Submitted by Bob Stothfang on Wed, 01/21/2009 - 5:48am. The second girl from the left has the bolt on her rifle closed. Not safe unless you're in a position to fire the thing. Submitted by David Bain on Wed, 01/21/2009 - 5:20am. You don't often meet a woman who's shot her own wardrobe! Submitted by Vic on Wed, 01/21/2009 - 2:49am. The administration had decided that showing the twin-bill of "Annie, Get Your Gun" and "The Story of Lizzie Borden" was not a great idea. Submitted by Vic on Wed, 01/21/2009 - 2:44am. "Looks like someone's been down here with the ugly stick." Submitted by stinky on Wed, 01/21/2009 - 12:31am. Third from the left. Look out for her; she's on a mission. Not a particularly friendly looking bunch of gals. If you run into them on the street, smile, nod your head and KEEP WALKING! Submitted by JimsShip on Wed, 01/21/2009 - 12:08am. "The Great Man Hunt" of 1925 is about to begin! Submitted by Samham on Tue, 01/20/2009 - 11:29pm. to wipe out the rest of the team! Looks like the fuse is VERY short!